Sometimes you encounter errors, that seem to stick around forever. I recently noticed on my SharePoint 2010 dev-machine, that the ULS doesn’t seem to be working anymore. For some strange reason the ULS is complete empty. No logmessages whatsoever. Changing the loglevel doesn’t seem to have any impact at all. Only messages while deploying solutions from Visual Studio 2010 where showing up in the log. After ignoring this problem for a couple of weeks – who needs logfiles anyway, when you’re doing everyhting the perfect way! – I actually did run into a problem with a custom component and I just couldn’t figure out what’s going wrong. 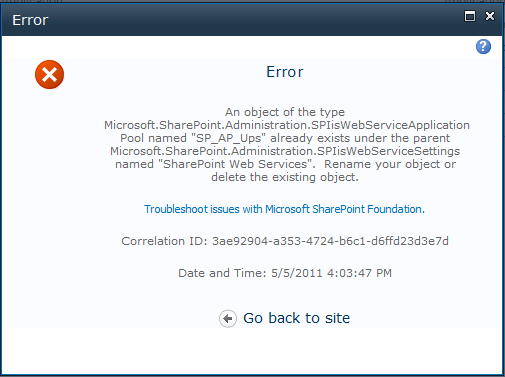 Having SharePoint present me a correlation-id doesn’t help at all if you have no logmessages! The solution is actually quite simple, and it’s always the same cause when working with SharePoint: permissions! I get the feeling, that 90% of all errors and problems are related to permissions and security. This kinda leads me to thinking, that no two SharePoint installations are the same. When I comes down to security and permission settings all installations differ. Even if it’s just a tiny bit – this is sometimes all it needs to take a system down. Back to my originial problem, well actually to the solution of my problem. The solution was, to add the account for application pools to the “Performance Log Users” group. So far the accounts where just a member of the “Performance Monitor Users”. Heaven knows why and how this happened. A quick comparision with another SharePoint installation revealed, that on that machine the application pool account was just a member of the local users group. The account was not a member of any other group (WTF?). 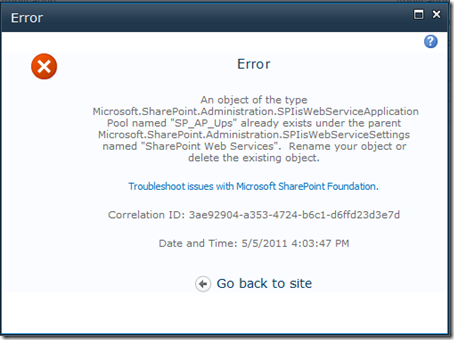 Even though you deleted an application pool in IIS, sometimes SharePoint doesn’t seem to care. I recently had some trouble setting up the user profile service, and needed to delete the UPS because of some misconfiguration. When I wanted to recreate the application pool I got an error, stating the application already exists. This is almost to easy to be true. BTW: when deleting the UPS (the service application), the application pool does not get deleted in IIS. This is extremely ugly, especially since the app-pool name is just some guid. When re-creating the service-application using the same settings as before (especially the same app pool name), this fails, because the name of the app-pool and the corresponding guid name for IIS seems to be stored in the configuration database. During SharePoint development you just need a whole bunch of sites. Creating them just for test purpose using the central administrations seems to be to much hassle. Instead I created a little batch-file to take care of spinning up a new test-site. Basically you just have to edit the variables at the beginning of the script. Just specify the port, the site name, title and description. The name is used to create the web-application, application pool, the database and the stuff. When creating the new site-collection for the web-application I did not provide a template; this way I can choose a template at the first call to the newly create site. "%SPAdminTool%" -o createsite -url http://localhost:%sitePort%/ -owneremail me@acme.local -ownerlogin acme\me -ownername "Acme Big Boss" -lcid 1031 -description "%siteDescription%" -title "%siteTitle%"
I already created a list of version numbers for SharePoint 2007 (which seems to be a little outdated as it seems). Dux Raymond premiered on BPC09 his song SharePoint is Nice Nice Baby. Last year he performed a new song at ShareFest 2010.